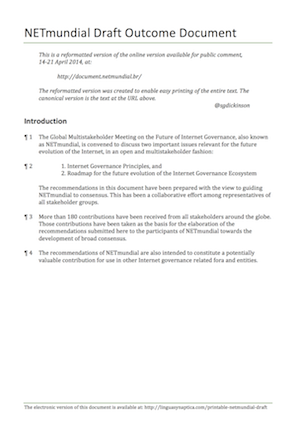 There’s only a week (14-21 April 2014) to provide your comments online about the long-awaited (but widely pre-leaked) NETmundial draft outcome document. On one hand, the public comment version of the document is fantastic because it allows people to comment, paragraph by paragraph, and see what everyone else has commented. On the other hand, though, it’s spread over three web pages, and the HTML doesn’t exaclty make it easy to follow the bulleted and numbered lists in the draft.